Carte de l'Iberie ou Espagne Ancienne. 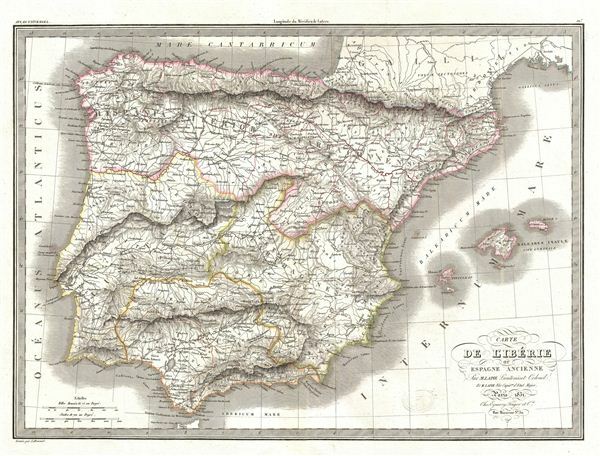 A fine first edition example of M. Lapie's 1831 map of ancient Iberia or modern day Spain and Portugal. The map covers all of Iberia under the Roman Republic from the Atlantic Ocean to the Mediterranean Sea. This includes Hispanic Citerior or Tarraconensis, consisting of the Baetica, Lusitania and Carthaginensis. Although the Romans controlled most of the Iberian Peninsula from about 218 BCe, it took them close to two centuries to fully subjugate the region. This map was engraved by Armand Joseph Lallemand as plate no. 10 in the first edition of M. Lapie's important Atlas Universel. This map, like all maps from the Atlas Universel features an embossed stamp from the Lapie firm. Rumsey 2174.010. Phillips (Atlases) 754, 765.